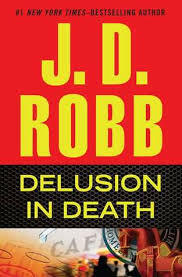 I don’t know how she does it, but JD Robb gets better with every book. She’s so prolific and a part of me keeps thinking she’s going to start showing the wear and tear on her muse, get a little worn around the edges. Instead, she’s honing her edge and her muse has never been better. Delusion in Death is a Lt. Eve Dallas story. She’s back from the city of Dallas where she ran into her mother and an evil serial killer. She’s still bothered by nightmares but of course, her husband Roarke, is keeping an eye on her and providing comfort. In Delusion in Death mass hallucinations have resulted in nearly 100 deaths in a neighborhood bar. Dallas and her team are the investigators. Have terrorists perfected a chemical weapon? What could make a crowded room full of people all have violent episodes? Nora Roberts (JD Robb) has written a gripping who-done-it, that’s also part how-done-it. Her characters continue to grow and change but they remain themselves. And I wouldn’t want it any other way. If all goes well, I may get to meet Ms. Roberts in person while I’m in San Antonio! I’m beyond thrilled at even the possibility. I’ll keep you posted!